Adopts japanese industrial piezo electric printhead which support 4 grade variable gray, with smallest 12pl ink droplet, the printer accepts 6 heads in it with 6 colors for the best printing quality. Advanced ignition frequency, industrial piezo electric printhead support faster movement. The printers advanced motor, ink ways, mechanics, feeding and taking up system for the higher speed and higher definition mode printing. 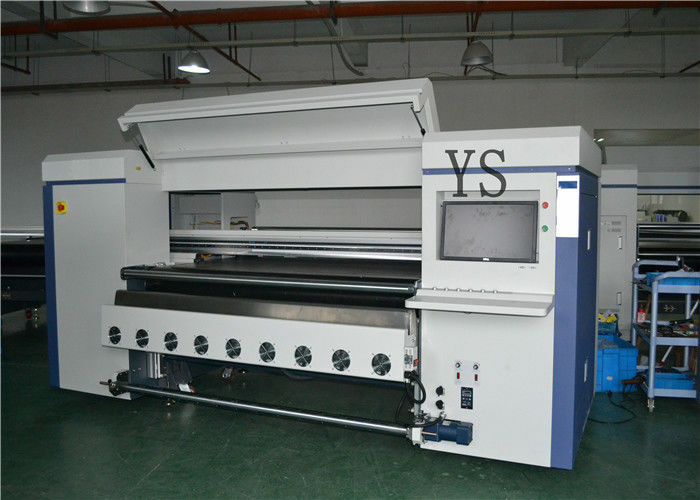 Variety of cloth winding way for more cloth fabric printing, enabling customers for more cost-effective investment, to seize market opportunities. We provide 12 months trouble-free warranty and online support for all of our machines. When some technical proble,please send detail description,photos or vedio,then our technician will give the resolution accordingly. There are complete English user manuals to guide you easily install ,operate and maintain the printer. It’s clear and easy to understand. Due to our plenty of export experience of almost 10 years, high quality, safe packing, on-time delivery and good after service are thus guaranteed. Ask our consultant for every details about our printers. We will deliver the goods within 5 working days after receipt of your payment, and keep you informed about the order status. Balance payment should be paid before shipment. Confirm to us upon receipt of order.